Heavens to Betsy! I meant to write this on April 17th which is International Stop for Pedestrians Day. Did you celebrate it? As long as we're on the subject of new and exciting holidays, I am always dumbfounded that August 15th is not a national holiday in honor of Julia Child's birthday. Raise your hand if you agree that we should be celebrating this gastronomic maven mid-August. Let's all go on a picnic with a Provencal theme and spend hours eating and gazing up at the sky and putting our feet in a river. Periodically throughout the year we can honor the work our gadgets do with Appliance Appreciation Week. Honestly, I bow in gratitude to my dishwasher, fridge, oven, stove, washer, dryer, vacuum. Phew. They do so much hard work. Take a moment to thank them. My personal favorite is Universal Photosynthesis Month. Maybe it is in June. Yes, it starts on the solstice. How crazy is photosynthesis? We couldn't survive without it. Let's all go on a picnic...oh, wait, we already did that. Let's do it again! In the Canaries. We will launch it this year on El Hierro with a month of picnicking and sky gazing and seaside fun. Everyone will go home with their own goat. Even if you missed April's International Stop for Pedestrians Day, you get another chance to honor those on foot this July 4th. For those of you I haven't told yet, last July 4th I was crossing the street and was hit by a Prius - the silent killer. A word of caution to those of you who drive a Prius, don't back around corners quickly on the wrong side of the street into handicapped people with PTSD. That's all I'm going to say about that. I'm still in shock. Many of you kindly inquire into my current recovery status and I thought I would write a little update here. I am still a professional rehab patient, my days are shaped by appointments and home exercises, resting, and icing, and focusing on healing. I would say I am half person and half patient, at this point. ~ Brain and PTSD: having a brain injury is an on-going learning experience. It is a little bit like being a new person. I often feel drunk and developmentally delayed. The best thing is just to laugh a lot about the cognitive difficulties. Because of my background in Somatic Psychology and Meditation and Neuroscience, I am making a good recovery with the PTSD. It is a daily challenge yet less so now than before; i often feel attacked by the external world, lots of quiet and solitude are good for me. My main triggers are loud noises, bright lights, cars, intersections, hunger/thirst, feeling cold, exhaustion, ambulances, to name a few. I spend hours a day practicing tools and skills to rewire my nervous system and resolve the inner constrictions. It works! ~ Neck: i still marvel that I broke C2 in three places and lived to tell about it. Mainly I have lack of range of motion, vertigo, and some pain/headaches with this. I do exercises and get bodywork. I think in time I will regain the mobility. ~ Knee/Leg: other than the brain/ptsd thing, this continues to be my biggest hurdle in terms of living a "normal" life. I long to walk and run and move spontaneously. I am like a 90-year-old a little bit with my leg. 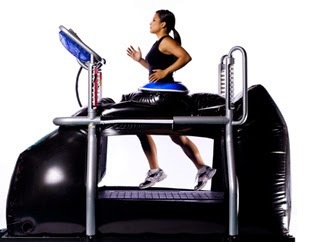 I just started a new therapy, pictured above, called the Alter-G. That is not me in the photo! I am in love with the machine. It allows me to walk with only 50% of my body weight and thus pain free. I use it twice a week for 20 minutes and it is heavenly. I am almost up to a normal pace and it feels so good to move! Our bodies love walking. It is such good therapy. I do pool therapy and restorative yoga and bodywork and acupuncture and essential oils. Each is working in its own way and it is slower than I would ideally like. But i am determined and dedicated to keep healing. ~ Arm/Shoulder: i hurt my arm in the Prius incident. It is painful and weak. This is a huge bummer of course. But I am doing various things and hope it will heal so I can one day carry stuff and bake as much as I would like and, hey, brush my teeth with my right arm! The spiritual lessons are manifold and rich and profound. Mostly it is about learning how to be happy without physical comfort which we love so much. Learning how to be in the present moment intimately without any barriers, to slow way, way down, be gentle. Opening my heart to all the joys and sorrows, pleasures and pains. Remembering how fortunate and blessed I am and not imploding with self-cherishing. Being tenderized by my suffering so that I can empathize deeply with others. And that is just scratching the surface. Most of what I am learning can't be put into words. SADITUDE: feeling grateful and sad at the same time. REJEALOUS: rejoicing for someone and being jealous of them at the same time. PARADOXYMORON: embracing life's complexities, bearing witness to everything. RIDICULOPATHY: when the pain gets so bad it's just ridiculous. My biggest refuge is the Buddha's teachings. This accident has propelled me deeper into the profundity of the path. And that is the blessing of obstacles. When life is going great and everything is hunky-dory, then there's not much motivation to practice or transform. But when everything falls apart, then we have a choice about what to do with the pieces. It's my aspiration not to put the pieces back together, really. I don't even know what that means. I am still a gooey, messy chrysalis. The butterfly is yet to come. One thing I know for sure, though. I can relate to so many more people on the planet, to the fringes. In my cells I know something about what it is to be chronically ill, physically impaired, to be feeble and housebound, to be poor and afraid, to be painfully tortured, to be dependent, to give up personal privacy, to be mentally unstable. I pray we all invite the fringes into our lives more and more. Seek out an elder, a neighbor, a sick person, an injured person, a person on food stamps, a housebound person, a disabled person, a grieving person - notice who is living on the edges and invite them into the middle just a bit. It is really easy and it makes a huge difference. Let us live more with our eyes wide open. Who and how can we help today? Who might we be overlooking or ignoring? Thank you to all of you who continue to support me through this big experience. May my recovery be shared with all those who need it. And may my pain relieve the suffering of others.